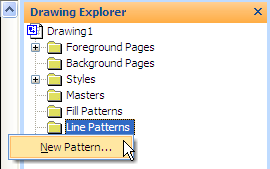 Before I get going I should point out that there's lots of great information on general custom line patterns out there, first and foremost of which is the Custom Patterns section in Developing Visio Solutions. There's also examples such as John Marshall's sine / cosine patterns and an excellent 'Thought Bubble' post at Green Onions. Aside from John's wave patterns if you want to get your hands on some example file downloads then check out the end of the next post where Chris Roth has generously added some great resources. A pattern is effectively just a special type of Master shape and as such you can edit it and copy it between documents just as you would a normal Master shape. 1 - Repeat and bend to fit curved line. 2 - Repeat without bending. 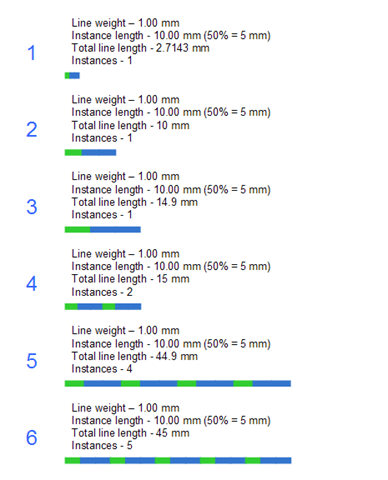 3 - Stretch single instance along length of line. 4 - Repeat on top of line. Once you've made this choice there are two key things that affect the size of a custom line pattern: scaling and line weight. If you check the Scaled tick box the resulting pattern will be exactly as it is represented in the Master. This is useful if you're trying to represent real world objects that have fixed dimensions (eg the gauge of a train track). For non-scaled patterns the size of the shape is determined by the weight of the line to which it is applied and how the pattern shape sits within its alignment box. The pattern's thickness and length are handled in different ways (although they are connected, as we'll see), so I'll look at these separately. As I mentioned, the line pattern thickness is determined by the applied line weight and this is taken from the height of the alignment box of the pattern shape. For example, the first pattern shape below will be exactly the thickness of the line, while the second one will overlap the line (in this case, by a factor of two). Now, this means that if you apply the top pattern to a line with weight number 1 the resulting line will have a thickness of 0.08mm. That's pretty small and when viewed at 100% it means that you don't get to see any real pattern at all. Using the second pattern, and the same weight number, results in double the visible thickness (0.16mm). This might still not be enough for most situations, but if you applied a weight number of 17 the result would then be 2.88mm, something approaching useful in terms of visibility. The point is that you need to think about the line weights in your document as this will effect the way you design the pattern shape. 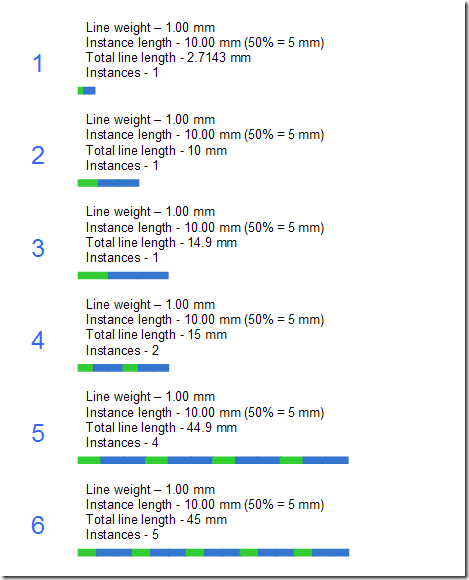 Below is a table of the standard Visio line weights and their respective thickness. OK, so that's thickness dealt with. 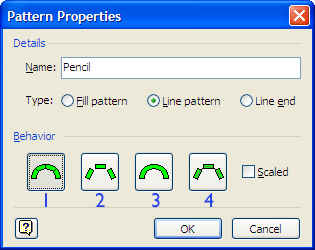 Now, let's look at how the width of a pattern shape behaves when applied to a line. Visio's built-in and custom line patterns behave differently when sized along a line. While built-in pattern instances are clipped to fit the line length, custom pattern instances are compressed or stretched to fit so that you only get whole instances of the original shape. In the first example the actual line length is less than the length of the pattern shape and so a single instance is compressed. Next, the line length equals the length of a single pattern shape and so a single instance is used neither compressed nor stretched. Here, the line length is greater than the length of a single pattern shape, but still just within a 50% margin (of the pattern shape) and so a single instance is stretched. Now, 0.1 of a mm more pushes the line length over the 50% limit and so now the line uses two compressed instances. The final two examples (5 and 6) show that this sequence, of not stretching any instance shape beyond 50% of its original size, is repeated as long as the line is expanded. Well, I hope this hasn't given you too much of a headache! In the next post I'll explore how to deal with random aspect of line patterns. Of course, although this particular post is about line patterns, there are two other areas that can be customised in a similar way. These are 'Fill Patterns' and 'Line Ends' and you can find out more about both of them in the DVS link at the top of this post.